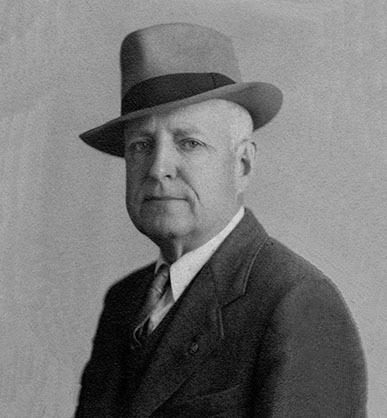 Hugh "Doak" Rankin was born Hugh Dearborn Copp on July 2, 1878 in Loda, Illinois. His father, William H. Copp, was born in 1841 in New Hampshire. His mother, Ellen Houser Rankin, was born in 1853 in Ohio. His parents married on January 14, 1874 in Chicago, and had three children, Carl Rankin Copp (b.1876), Hugh Dearborn Copp (b.1878), and Raymond Hersey Copp (b.1881). The father was a dry goods merchant. The mother was descended from a prominent family with a long and distinguished reputation in American history. The family lived in Loda, IL, at the home of the maternal parents, Dr. Andrew Campbell Rankin (b.1828) and Susanna Roush Rankin (b.1829). On January 3, 1879 the eldest son, Carl Rankin Copp, died at the age of three. 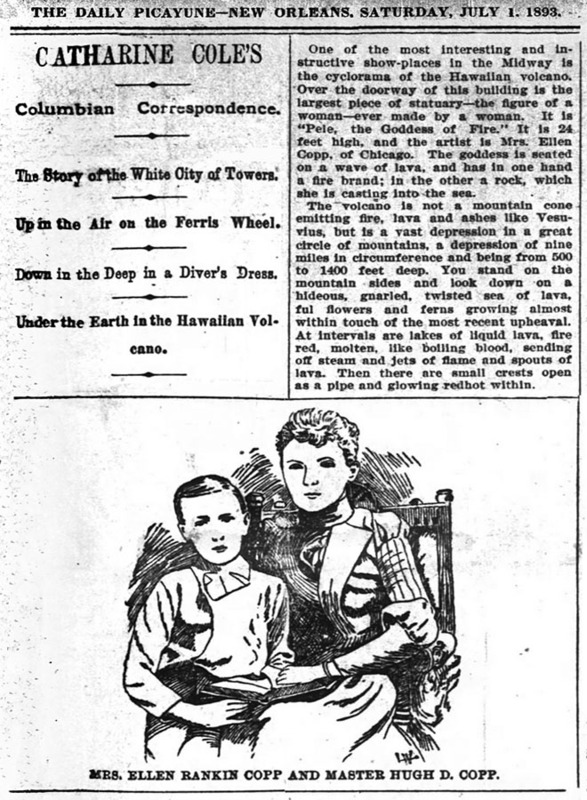 On February 4, 1884 the youngest son, Raymond Hersey Copp, also died at the age of three. After this second tragic death the family left Loda and moved to Chicago, where they lived at 9 111th Street in Pullman, IL. In 1888 the mother began to study at the Art Institute of Chicago. By 1890 she was the first woman student to win the school's most distinguished award for sculpture. In 1892 the mother began to build a monumental statue of Pele, the Hawaiian goddess of fire, which was commissioned for the Hawaiian Pavilion at the upcoming World's Columbia Exposition in Chicago. 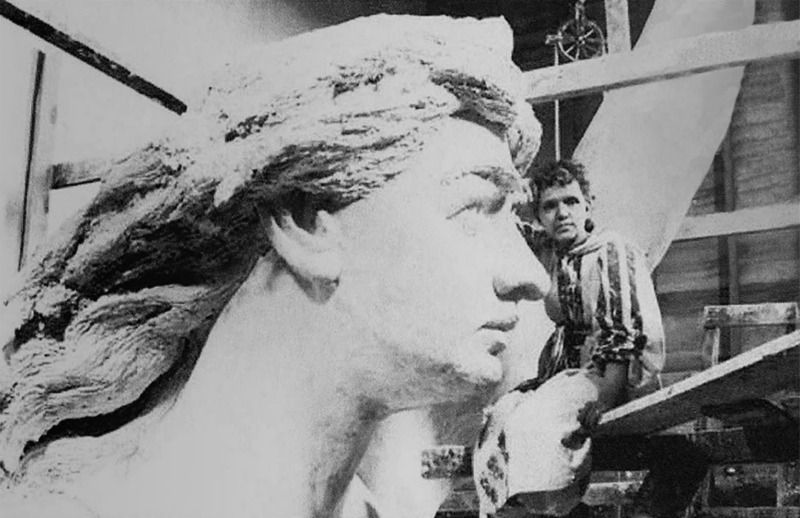 She built the giant plaster statue in her art studio on State Street in the Studio Building. 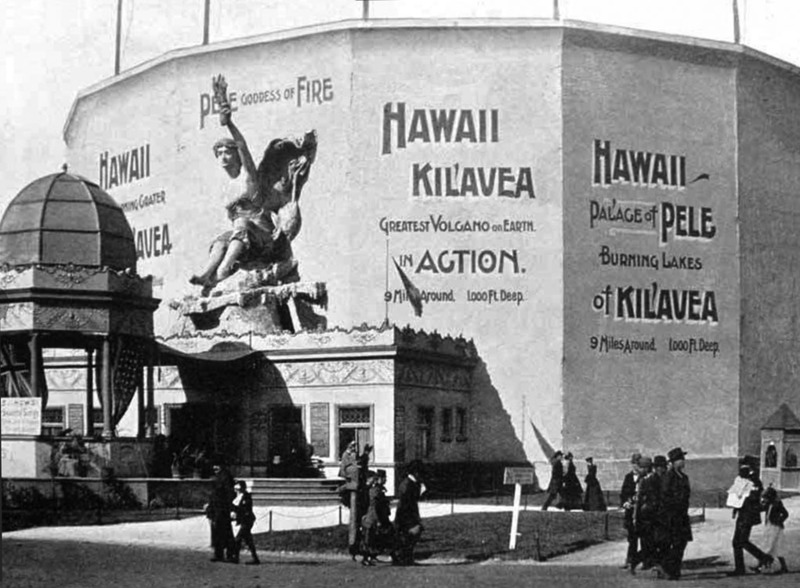 In 1893 her statue of Pele was installed above the entrance to the massive diorama of the Hawaiian Volcano Kil'Avea at the fair. The twenty-five-foot sculpture was promoted as "the largest statue ever build by an American woman." At that same time, Hugh Copp sculpted a charming panel of Pixies and Brownies in a hurdle race, which was accepted by the Board of Lady Managers of the World's Fair and exhibited in the Childrens' Pavilion. On July 1, 1983 nationwide newspapers celebrated the remarkable mother and son who were both exhibiting popular sculptures at the Chicago World's Fair. 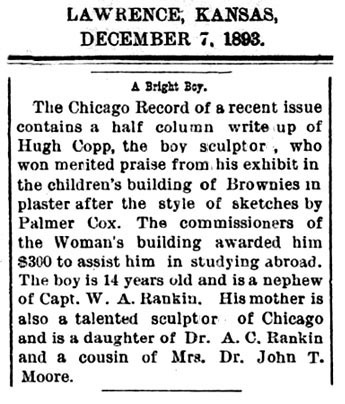 On December 7, 1893 nationwide newspapers reported that Hugh Copp, a boy sculptor of fourteen, had won merited praise for his fairy tale sculpture at the Columbia Exposition. The Commissioners of the Fair awarded him a $300 scholarship to study abroad. By 1894 the marriage of his parents had grown unhappy. The mother sought a divorce for desertion. The mother and son left Chicago and moved to Munich, Germany, to study art for one year. At that time Hugh Dearborn Copp was age sixteen. 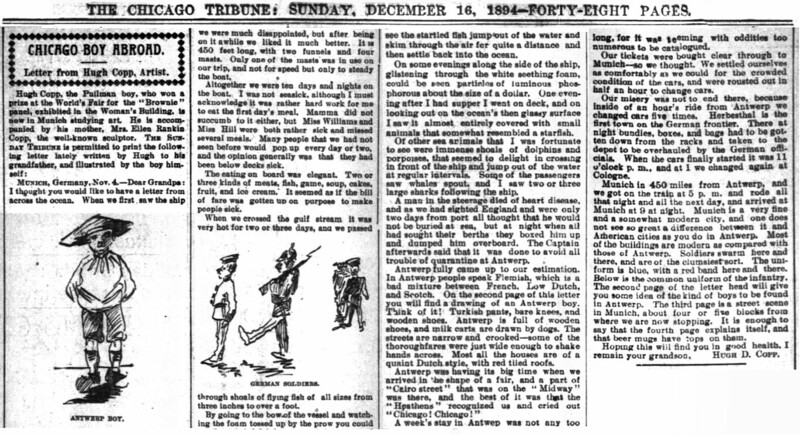 On December 16, 1894 The Chicago Tribune reported "Chicago Boy Abroad - Letter From Hugh Copp," which featured an illustrated account of his voyage across the Atlantic and impressions of life in Germany. 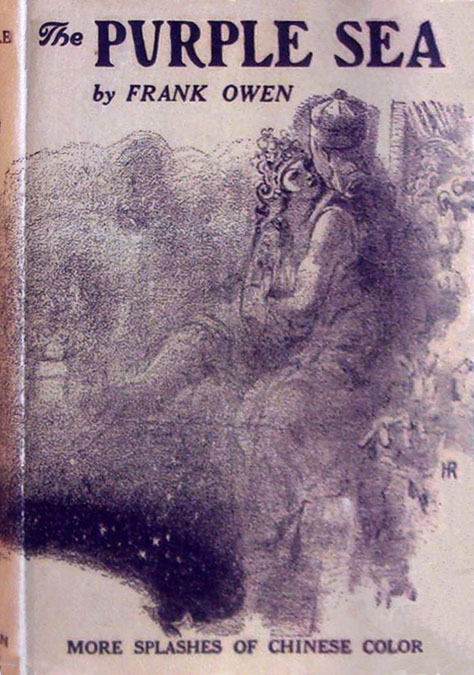 In 1895 the mother and son returned from Europe to Chicago, where the parents attempted to reconcile their unhappy marriage, while Hugh Copp enrolled in a local high school. In the fall of 1896, during the Thanksgiving season, Ellen Houser Rankin and Hugh Copp, moved out of their home in Chicago, and back to the maternal grandparents home at 9 111th Street in Pullman, IL. Six months later, in June of 1897, Hugh D, Copp graduated from high school in Chicago, after which he entered the work force as a clerk in the design department of the Pullman Car Company. 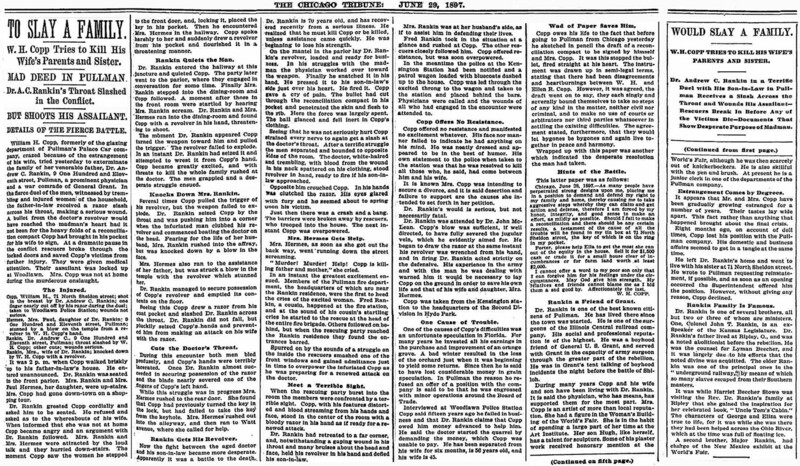 On June 29, 1897 The Chicago Daily Tribune reported the front-page headline, "To Slay A Family - William H. Copp Tries To Kill His Wife's Parents And Sister." The sensational article described a shocking account of the father's deranged attack on his wife's family in a violent fit of despair. He arrived at his father-in-law's home and asked to speak with his estranged wife. He carried a sheaf of hand-written pages that outlined a contract of reconciliation, which he wanted his wife to sign. He also brought a pistol and a folding razor, with which he attacked the family, after they told him she had gone out for the day. There followed a bloody struggle, after which he was arrested, and confessed to attempted murder of everyone who had come between him and his wife. A search of his pockets revealed a suicide note, which ended, "I cannot offer a word to my poor son, only that I can forgive him for his feelings, under the circumstances. May God give him strength." After this terrible experience Hugh Dearborn Copp erased all connection with his father, and assumed the name Hugh Doak Rankin, which means "Hugh, son of Rankin." 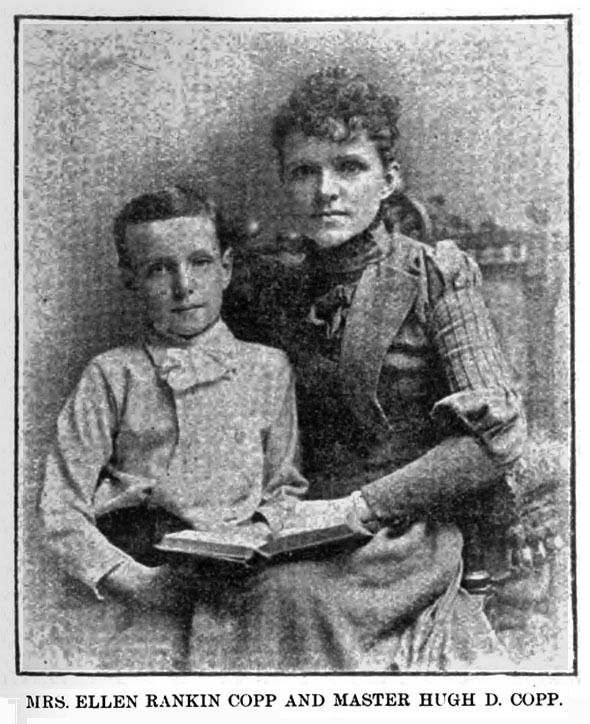 In 1898 the mother and son left Chicago and moved to Indianapolis, where she worked as an artist and he worked as a newspaper artist for The Indianapolis Press. The 1900 U.S. Census listed Ellen H. Rankin, a widowed "sculptor," age forty-six, and her son Hugh D. Rankin, age twenty-one, a "Newspaper Illustrator," living together at 2440 Shelby Street in Indianapolis. One year later the local business directory listed them at 314 East North Street. On August 8, 1901 his mother, Ellen Houser Rankin, died from cancer at the age of forty-eight. 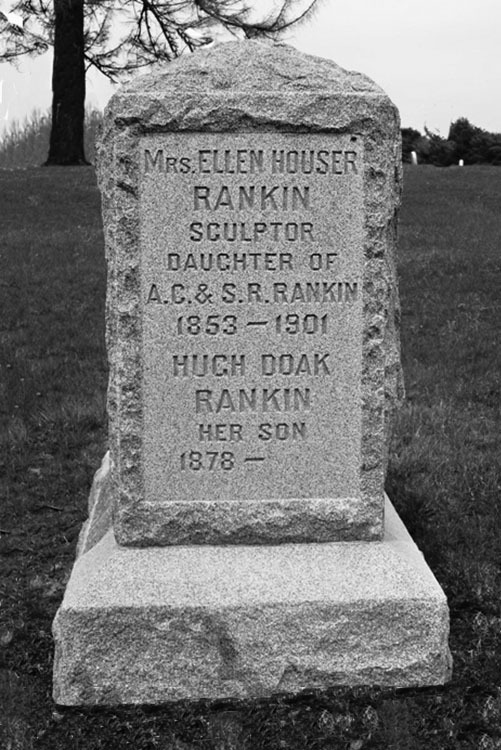 She was buried in the Rankin Family plot in Pullman, IL, where the son erected a granite monument to his mother, with her dates of birth and death, as well as with his own name, and the date of his birth, with a space left for the date of his own death, and thereby cemented his lifelong connection to his mother. On March 6, 1902 the patriarch of the family, Dr. Andrew Campbell Rankin, died at the age of seventy-four in Pullman, IL. After his grandfather's death, Hugh Rankin left Indianapolis and returned to Chicago, where he lived with his widowed grandmother, Susanna Rankin, age seventy-three, at 1246 East 46th Street in Chicago. Also living there was Aunt Louie Quindaro (Rankin) Hermes (b.1858), the sister of his mother, and her husband, Uncle Paul E. Hermes (b.1865), who worked in the advertising office of The Inter Ocean, a Chicago newspaper, where Hugh Rankin began to work as a staff artist. The 1910 U.S. Census listed Hugh Rankin, age thirty-one, as an "Artist at a Newspaper," living at the same home with his Grandmother, Uncle, and Aunt. On March 1, 1918, during the Great War, the selective service drafted Private First Class "Hugh Dearborn Copp," which indicates his name was never legally changed to Hugh Rankin. He served overseas with the U.S. Army in the 50th Infantry of the 20th Division, and was honorably discharged in 1919. On April 10, 1921 his father, William H. Copp, died at the age of eighty in Chicago. 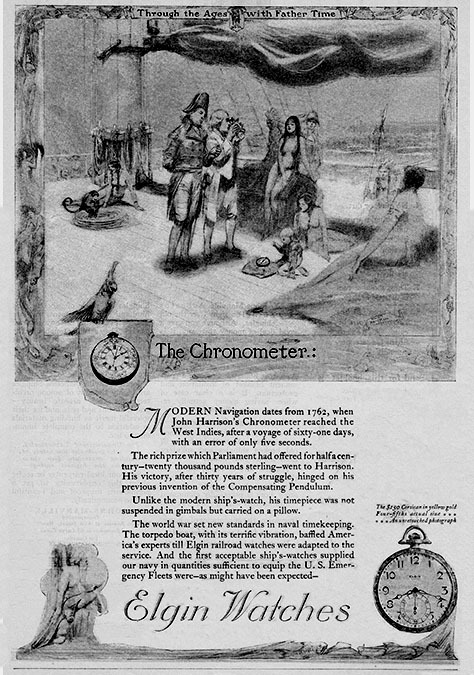 In 1921 Hugh Rankin began to illustrate a series of magazine advertisements for the Chicago based Elgin Watch Company. 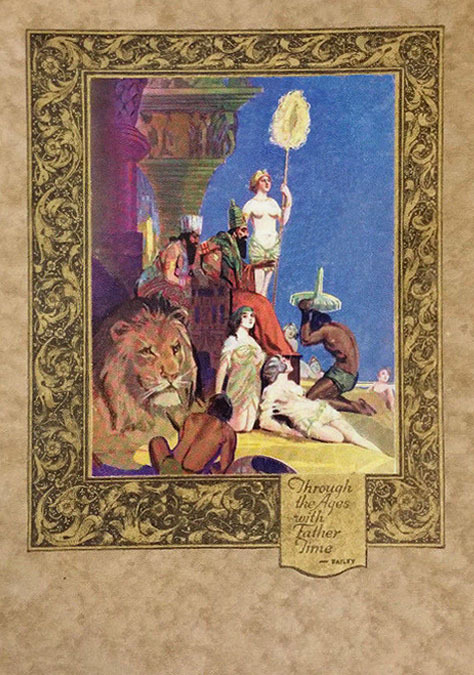 In 1922 his collected illustrations were compiled in colorful promotional booklets "The Romance & History of Time" by R. R. Bailey, and "Through The Ages With Father Time" by R. R. Bailey. 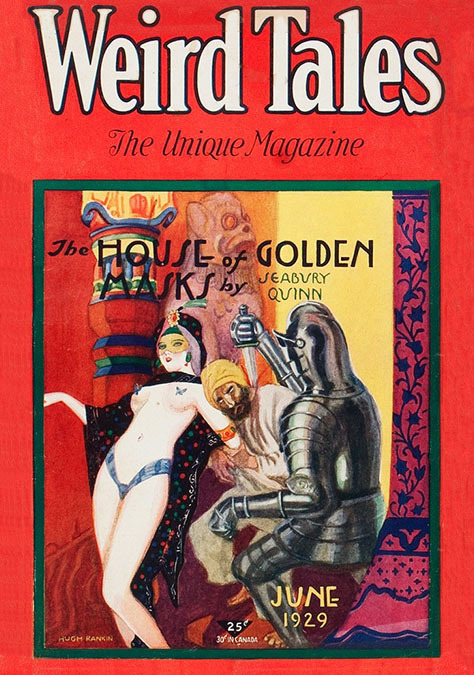 In 1926 Hugh Rankin began to illustrate stories for America's Humor Magazine, which was produced in Chicago by the William B. Ziff Publishing Company. The editor was Bernard George Davis. 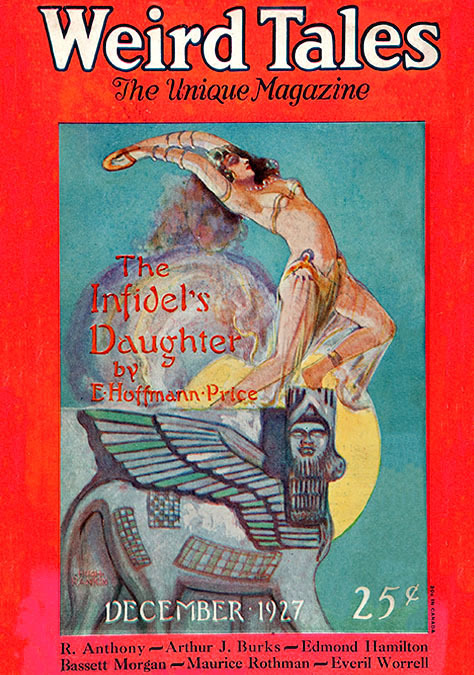 The Publisher and Editor soon formed Ziff-Davis Publications. 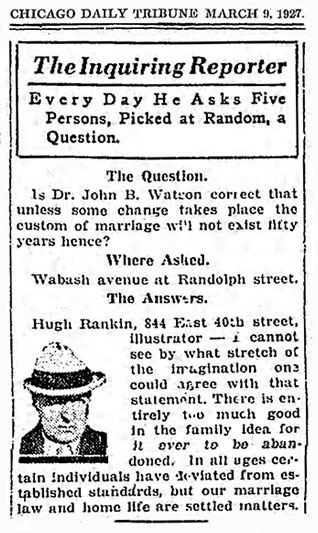 On March 9, 1927 The Chicago Daily Tribune feature, "The Inquiring Reporter," asked random pedestrians on Randolph Street, "Is Dr. John B. Watson correct that unless some change takes place the custom of marriage will not exist fifty years hence?" One answer was provided by "Hugh Rankin, 844 East 40th Street, illustrator," who said,"I cannot see by what stretch of the imagination one could agree with that statement. There is entirely too much good in the family idea for it ever to be abandoned. In all ages certain individuals have deviated from established standards, but our marriage law and home life are settled matters." 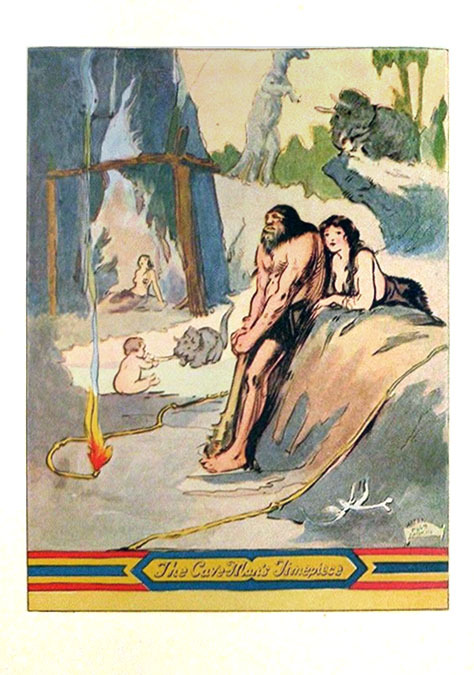 During the 1920s Hugh Rankin illustrated several books, such as "The Camp Fire Girls in Old Kentucky" by H. L. Sanderson from Reilly & Lee of Chicago. "The Purple Sea" by Frank Owen from The Lantern Press. "Johnny Goes A-Hunting" by C. L. Cooper from Rand McNally. He also illustrated the English textbook, "The American Language Series" by J. Fleming Hosic, also from Rand McNally. 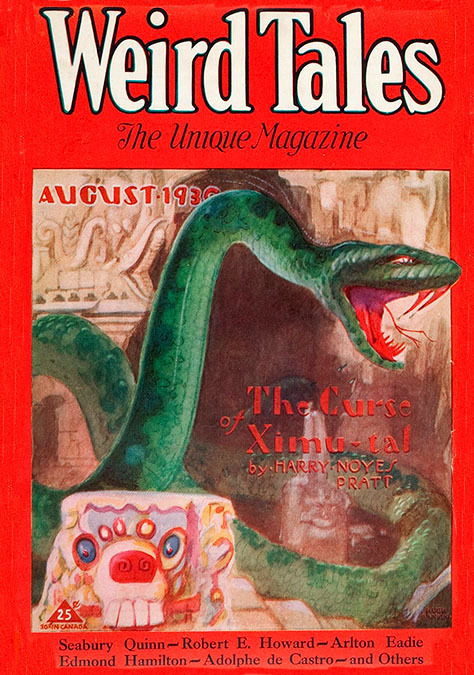 The July 1927 issue of Weird Tales was the first to include illustrations by Hugh Rankin. 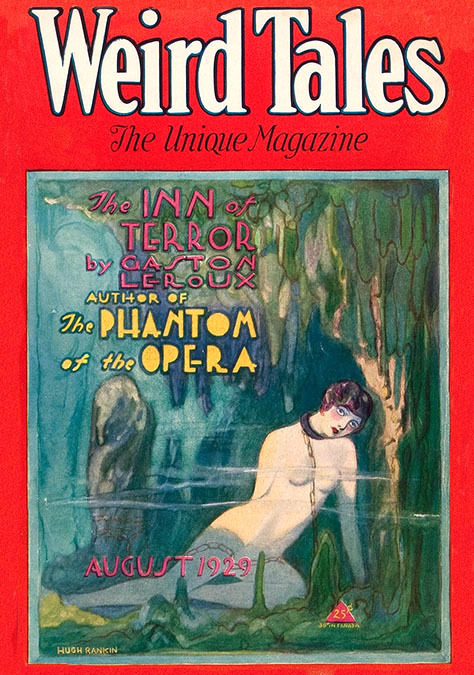 Over the next eight years he went on to draw pen and ink story illustrations and painted covers for many issues of Weird Tales, which was produced by Popular Fiction Publishing. 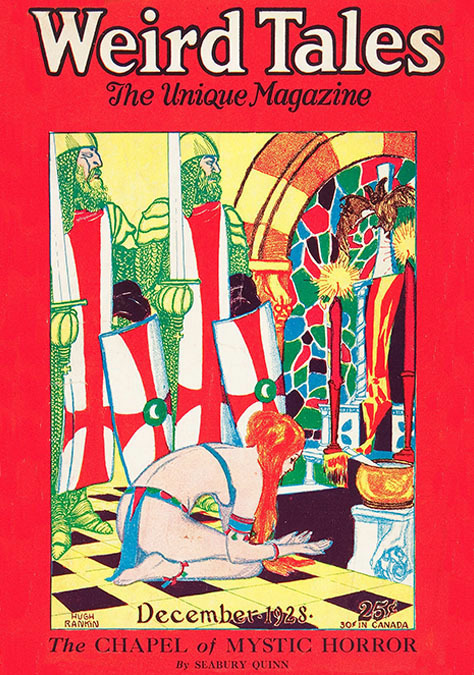 Hugh Rankin was their top cover artist, along with C. C. Senf and J. Allen St. John. 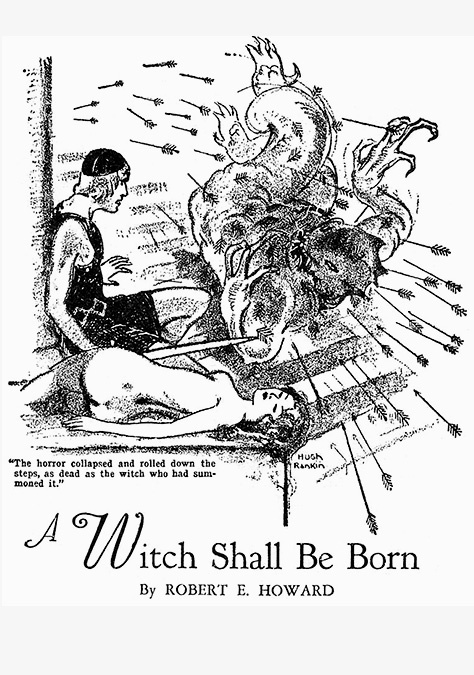 But by 1930 they were replaced by the alluring cover art of Margaret Brundage. 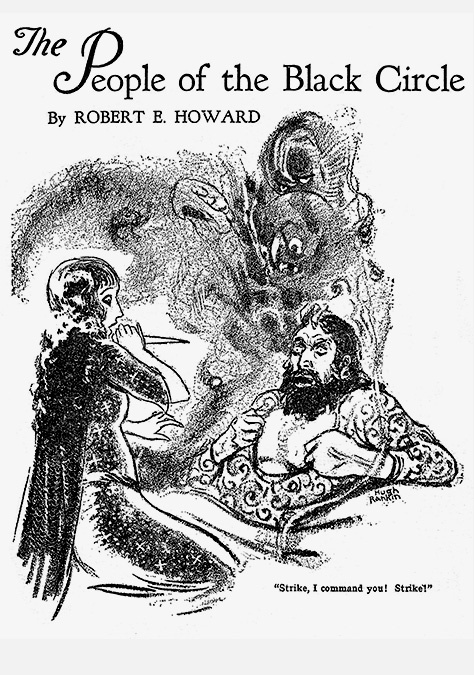 During the 1930s Hugh Rankin only drew pen and ink story illustrations. 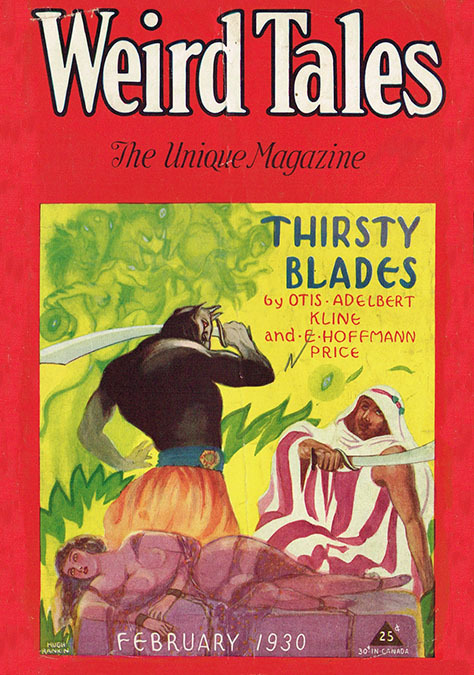 The famous author Robert E. Howard once said Rankin was his personal favorite of all the artists that illustrated his work for Weird Tales, but by 1936 the artist had ceased to work for the magazine. In 1938 Hugh Rankin left Chicago and moved to Los Angeles, California, where he worked as an art instructor of young boys and girls at the Recreation Project, a division of the Works Progress Administration (WPA) at 1206 Santa Street in LA. In 1940 he lived with his Aunt Louie (Rankin) Hermes, and her husband, Paul E. Hermes, at their home at 827 North Rampart Boulevard in Los Angeles, CA. In 1928 they had moved to LA, where the uncle worked as an insurance inspector. On May 14, 1940 his Aunt Louie (Rankin) Hermes died at the age of eighty-two in LA. On April 26, 1942, during WWII, "Hugh Doak Rankin" registered with the selective service and was recorded to have been sixty-three, five-nine, 165 pounds, blue eyes, gray hair and a light complexion. He never married and he had no children. On August 28, 1949 his uncle Paul E. Hermes died at the age of eighty-nine in LA. Hugh Rankin died age the age of seventy-seven in LA on January 3, 1956.